dis COMPANY’s David Salidor who served as celebrity booking producer for XM’s Brett Winterble eponymous talk show, has exited the post, as a format-change next month is in the works for the satcaster. Said Salidor, “I know for a fact that in the 18 months I was there, we built a very strong base for Brett. His interviews with the likes of Steve Van Zandt; Micky Dolenz; Rudy Giuliani; Robert Funaro; Peter Max; and, Malcolm McDowell were very well received. I want to thank Brandon D’Amore for the opportunity. It’s a real shame this is not continuing as Brett had a real gift for the interview. He listened. Salidor continues to operate his PR/Management firm the dis COMPANY. Stanley Kubrick was one of the great filmmakers of our time and his profound influence on motion pictures continues to this day. His 1971 film, A Clockwork Orange, starring Malcolm McDowell, portrayed an oppressive lawless society where man was reduced to little more than a machine. The film introduced into popular culture the concept of “ultra-violence,” as singing, tap-dancing, derby-topped hooligan Alex (McDowell) has a “good time” – at the tragic expense of others. His journey from amoral punk to brainwashed proper citizen and back again forms the dynamic arc of Kubrick’s future-shock vision of Anthony Burgess’ novel. This was a powerful film made by a director at the height of his artistry and its impact generated worldwide controversy. Forty years later, the world is a different place but the film’s power still entices, shocks and mesmerizes today. 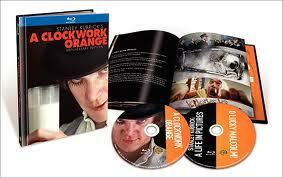 On May 31, Warner Home Video will honor Kubrick and the film with A Clockwork Orange 40thAnniversary Edition on Blu-ray ($34.99 SRP). The two-disc release includes two newly-produced bonus features: Turning Like Clockwork, a 25-minute documentary about the film’s “ultra-violence” and its cultural impact, and a short documentary where Malcolm McDowell reminiscences on working closely with the legendary director. This two-disc edition will also contain the feature-length documentaries, Stanley Kubrick: A Life in Pictures and O Lucky Malcolm! The 40th Anniversary Edition will be packaged in a 40-page Blu-ray book with rare photos and production notes. McDowell’s Never Apologize will also be released on May 31 for the first time on DVD in the U.S. This spirited documentary pays tribute to British director Lindsay Anderson, who directed the actor in his films If and O Lucky Man and is based on his entertaining London and Edinburgh one-man stage shows. The film weaves McDowell’s experience of working with Anderson as well as tales of Sir Alan Bates, Sir John Gielgud, Sir Laurence Olivier, Bette Davis, Princess Diana, John Ford and Lillian Gish. Never Apologize will sell for $19.97 SRP. This will be a big year for Malcolm McDowell and A Clockwork Orange. The prestigious Cannes Film Festival will launch the celebration of the 40th anniversary of the release of Stanley Kubrick’s masterpiece with a special screening of a digitally restored copy of the film, joined by McDowell, Kubrick’s widow Christiane and brother-in-law Jan Harlan, executive producer on several of Kubrick’s films. Anniversary screenings will continue with a special event May 25 at New York’s The Museum of Modern Art with McDowell participating in a panel discussion. In the early fall, Malcolm McDowell will be feted by the Academy of Motion Picture Arts & Sciences which will include a screening of A Clockwork Orange at AMPAS, Los Angeles. McDowell stars in the upcoming film Vamps, directed by Amy Heckerling, opening later this year. And Franklin & Bash, the new TNT comedy-drama TV series debuting this summer features McDowell as the head of a buttoned-down law firm joined by two young, fly-by-the-seat-of-their-pants street lawyers who cause a seismic culture clash within the firm. He will alsobe featured in the upcoming film Silent Hill Revelation, the sequel to the 2006 hit Silent Hill.